Scotts Lemon Laundry Liquid is a laundry detergent which assists on cleaning clothes, removing stains and providing a fresh lemon fragrance. It is ideal for use in front loading, top loading and twin tub washers in hot, warm and cold water on all washable materials. 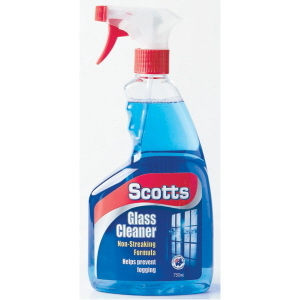 Scott's antibacterial spray and wipe that cuts through dirt, grease and grime without the need of rinsing. It has a fresh sweet orange scent. Scotts glass cleaner, ammonia free and streak free which helps prevent from fogging.